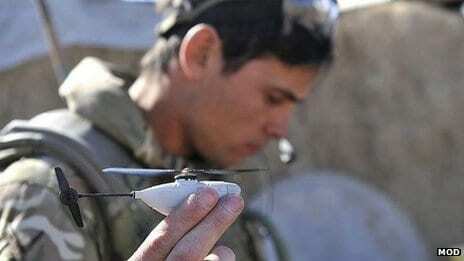 British soldiers in Afghanistan have become the first to use miniature surveillance helicopters in frontline operations. The drones can fly around corners and obstacles to identify potential hidden dangers, the Ministry of Defence said. The Norwegian-designed Black Hornet Nano features a tiny camera and relays video and still images to a handheld control terminal. They have been in use in Afghanistan since 2012, a spokeswoman confirmed. Surrey-based Marlborough Communications has a £20m contract with the military to supply and maintain 160 of the drones, which were originally developed by Prox Dynamics for search and rescue operations. Mini drones can be piloted directly or programmed to follow co-ordinates using GPS. Powered by battery, the Black Hornet is reported to have a range of about half a mile (800m), a top speed of 22mph (35kph) and can fly for up to 30 minutes.